The scourge of the twentieth century was overly-powerful governments; could the looming problem of this century be too-weak governments? 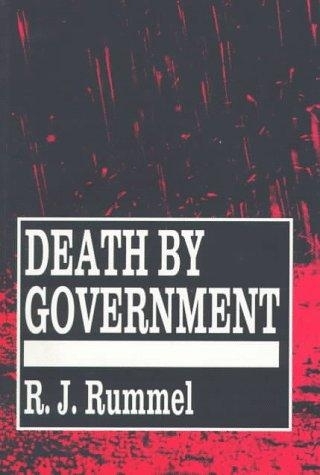 The political scientist R. J. Rummel estimates, in his evocatively titled study, Death by Government (New Brunswick, N.J.: Transaction, 1994) with revised numbers in 2005, that deaths at the hands of one's own government in the period 1900-87 amounted to 212 million persons, while deaths from warfare numbered 34 million. In other words, victims of their own government (what he calls democide) were in fact over six times greater than those killed in the century's wars. The largest number of fatalities was 78 million killed by the Chinese Communists, then 62 million by the Soviet Communists, 21 million by the Nazis, 10 million by the Chinese nationalists, and 6 million by the Japanese militarists. Even this listing is incomplete; as Rummel puts it, "post-1987 democides by Iraq, Iran, Burundi, Serbia and Bosnian Serbs, Bosnia, Croatia, Sudan, Somalia, the Khmer Rouge guerrillas, Armenia, Azerbaijan, and others have not been included." Afghanistan: Since the coup d'état that overthrew the king in 1973, Afghanistan has not had a central government that could effectively control the country. Lebanon: Once called the "Switzerland of the Middle East," Lebanon has endured a mix of totalitarian rule by Syria and anarchy since the country's civil war began in 1975. Somalia: The Siad Barre regime fell in 1991 and has lacked anything remotely resembling a central government since then. The country's anarchy has led to a massive piracy problem in the Indian Ocean that already in 2007 was called "frightening and unacceptable" and since has grown yet worse. Palestinian Authority: Thanks to mismanagement and aggression, the Palestinian Authority has lost most of its authority since taking power in 1994. Half of its territory is under a hostile organization, Hamas. Pakistan: The tribal zones in the north have effectively shaken off the governmental authority. Iraq: The U.S. government made the mistake of disbanding Iraq's army after the defeat of Saddam Hussein in 2003 and the country has yet to tame the subsequent chaos. Sinai Peninsula: Egypt's central government already began losing control of Sinai in the Mubarak period (1981-2011) and this process has much increased with the post-Mubarak turmoil. Yemen: It's difficult to pinpoint a date when the country became anarchic, but the Houthi War of 2009 offers a reasonable starting point. Libya: Since the uprising against Qaddafi in early 2011, the country has not had a central power. Syria; The regime has lost control of several towns (Zabadani, Saqba) and more are likely to escape its authority. Mali: A war for control of the vast northern reaches of the country began 12 days ago when Tuareg rebels seized Ménaka, Aguelhok and Tessalit, quickly leading to anarchic conditions that could well spread and have an impact on nearby Algeria. The same story holds in many countries of Africa, including Guinea-Bissau, Liberia, and Sierra Leone. Parts of Russia and Mexico suffer from anarchy. Piracy has grown to the point that it afflicts several parts of the world. It also affects the open seas: pirates operating out of safe Somalia bases have terrorized the Indian Ocean for years. July 18, 2012 update: I review the growth in fawda from the perspective of the Jewish state in a weblog entry, "Anarchy Surrounds Israel." Islamists want to erase the nation state and its institutions, but they forget the people and their aspirations. Since they came to power in post-revolutionary Egypt and Tunisia, Islamists have been undermining the very idea of the nation state while pursuing other objectives. Their ultimate goal, some say, is the creation of a caliphate. But their most immediate success so far has been to challenge and weaken the very institutions that brought them to power. The dismantling of the nation state is not new to this part of the world. It already happened, to one extent or another, in countries such as Somalia, Iraq, Sudan and Lebanon. This seems to happen whenever the institutional makeup of the state is flawed to start with, or when the neo-Islamists arrive with their anti-state mentality. Although the formal map of the Middle East has not changed since the onset of the so-called Arab Spring (with the exception of Sudan), the old borders do not reflect the reality on the ground. As a result of the regional upheavals, tribal, sectarian, and ethnic identities have become more pronounced than ever, which may well lead to a change in the borders drawn by the colonial powers a century ago that have since been preserved by Arab autocrats. They then cover the situations in Syria, Iraq, Libya, and Yemen. Sep. 26, 2017 update: So many years later, this topic finally gets glancing attention from the mainstream media.